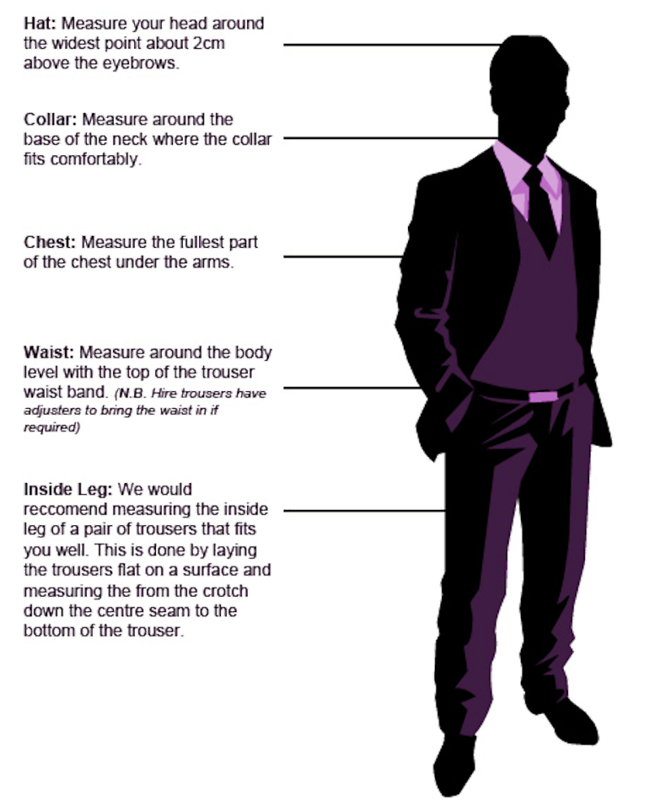 Often the best place to start when measuring yourself for a suit is your very own wardrobe! You can very often find most of the sizes you need from clothing you know fits you well. If you already own a suit, this would be a great place to start. The measurements for the suit jacket are usually located in the inside right breast pocket. The trouser size can be found in the waistband of your suit trousers, or if you don't have have a suit, another pair of formal or work trousers you may own. It is also likely that you will find your collar measurement in the collar of a formal or smart shirt you have in there too. Once you have all these sizes, please enter these and as many of the sizes requested below as possible. Unfortunately OH Suit Hire are unable to accept any responsibility for the fit of garments when your own measurements are supplied.